After finding the perfect dress for your wedding day, there are still a few things left to complete your look. One thing that you might spend a lot of time thinking about is your hairstyle. You probably don’t want your hair to cover your gorgeous gown. Maybe you don’t want it to make too much of a statement either because it could take away from your dress. Or, maybe you do want to go all out with a fancy up do and a flower crown. How often can you really wear a flower crown anyway? Now is your chance! Either way, there are so many hairstyles that could work for any type of hair and any fabulous gown you choose. If your gown is backless, but you want to add a little more detail to your overall ensemble, consider an up do with some flowers. 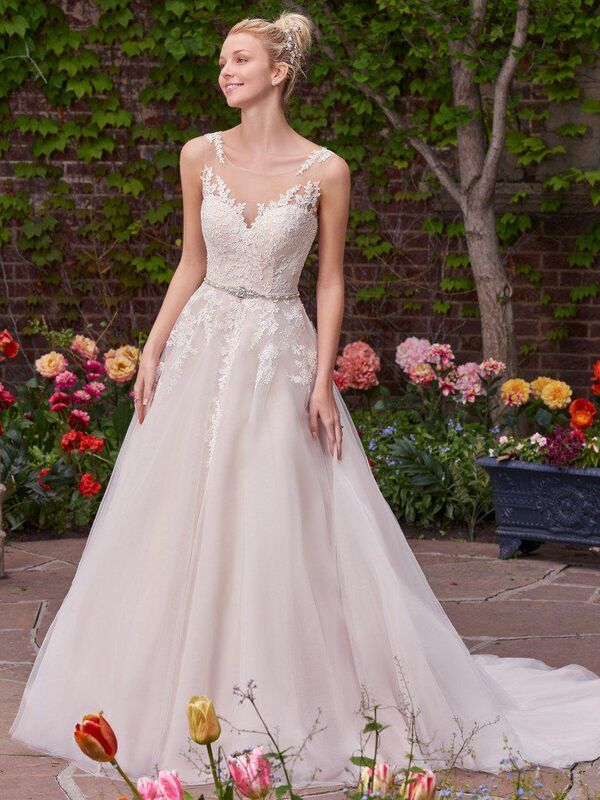 While these flowers may seem large, the light colors are delicate enough that they don’t take away from the lace of the dress. They simply add to the look. To keep your hairstyle on the simpler side, a ballerina bun might do just the trick. This classic hairstyle is so popular for our everyday looks, so why not for your wedding day? It’s sleek and classy, and with a nice headpiece can go from modest to dazzling. Do you have short hair? It can be tricky to do an updo with too short hair, but adding some waves and curls can switch up your look. You might also add a headpiece or some flowers to step the look up a notch. If keeping your hair up isn’t really your style, consider a half-up, half-down hairdo. This can either be really simple and relaxed or very regal and elegant, depending on your preferences. Another option is just adding some delicate, effortless, loose waves to your hair. You can accessorize with a headpiece to add some detail. You could also pin a few strands back with a hair clip. If you want to stay away from hair accessories in general, you could simply add a few twists and clip your veil in. Braids can take any look from understated to magnificent. A few twists and turns and your hair magically becomes a masterpiece. There are so many different braided hairstyles to choose from that it can be difficult to choose just one. Whichever you do choose, adding some flowers or clips can help to really make your braided hairstyle stand out from the crowd. If you are looking for a gorgeous headpiece to add to your wedding day hairstyle, visit Aleana’s Bridal! The day has finally come. You’re finally going to your first bridal gown fitting! But, are you bringing the right bra? Choosing the right bra to go with the perfect dress can be tricky. You want support and comfort. You also want to make sure the dress looks perfect on you. Don’t worry though! We’re here to help you out on your best day ever with a few tips and tricks to help you decide what’s best. No bra – You may not need a bra at all for your special day. It all depends on your body and how you feel personally. Many wedding dresses are very structured and offer a lot of support all on their own. Some might come with a support system built right in. For others, you could work with your salon and seamstress to add one to your dress. Backless, stick-on bra – These can be tricky, but if you’re sporting a backless dress for your big day or have fabric that’s on the thinner side, this works wonders. It offers coverage and sticks right to your skin, so you decide where it’s most comfortable for you. Bustier – If you’re looking to add a little more curve, this might be the one for you. This works especially well with a ball gown. You want the top part of your gown to show off your shape on your Cinderella day. A bustier or corset will really accentuate the waist and support your bust to keep you looking your absolute best. Bodysuit – If you’ve fallen in love with a particularly low-cut dress and sticky tape just won’t work for you, a bodysuit might be an option. These offer a little bit more support and shape to keep everything in place. You might also find a backless bodysuit, perfect for a backless gown. When it comes down to it, it’s all about what you feel the most comfortable in. Don’t wear a corset or bustier just because you feel you have to. Make sure you feel comfortable and beautiful on your wedding day. Choose what works best for you. Your bridal consultant and seamstress at your salon will be there for you to help you select the best option. Share your concerns with them and you’ll be sure to work it out. Fashion Forms and Dominique can be found at Aleana’s Bridal.